After marrying the love of your life, simply walking into your wedding reception seems a bit anticlimactic. Celebrate your nuptials—and wow your family and friends—with an unforgettable reception entrance. Any one of these seven ideas are sure to surprise and delight your attendees. For a more energetic entrance, dance to your chosen song as you make your way into the party. The dance can be choreographed beforehand or completely impromptu, which will probably spur some lighthearted laughs from impressed guests. Choose a tune with an upbeat melody and don’t be afraid to show off your skills. Want a dramatic entrance without all the attention focused on you? Then recruit your bridal party to participate in the dance routine! Plan out the details with bridesmaids and groomsmen before the big day, so they know to bust a move as soon as you enter the reception. Other guests will be undoubtedly surprised by the flash mob, but they’ll likely be inspired to join the fun. If your ceremony is outdoors, don’t be afraid to experiment with unique transportation options. Choose something that feels natural for your wedding theme and personality. If your ceremony is on a farm, for example, consider arriving by horseback or tractor. Other transportation options include a luxury or vintage car, a boat, a motorcycle, horse and carriage, or a sleigh. If you’ve hired a lighting company for your big day, plan a show-stopping light display for your grand entrance. Consider casting the entry point in a color wash, flashing dozens of strobe lights, or broadcast your wedding monogram with gobo lighting. Those with larger budgets can incorporate extra elements into their entrance plan. 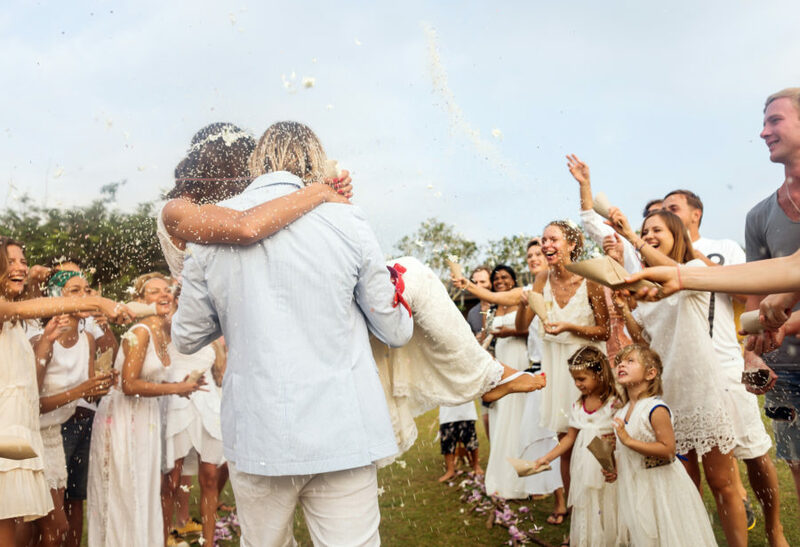 Secure festive items like as flower petals, confetti, or balloons on the ceiling of the venue, and have them fall as you cross the threshold into the reception. When the bride and groom leave the reception at the end of a night, guests often create a tunnel of sparklers to send them off. Draw inspiration from this idea and have a “reverse send-off,” where the bride and groom walk through a sparkler tunnel into the reception. If the celebration is indoors, the guests can create a walkway of bubbles or glow sticks instead. This article originally appeared in Martha Stewart Weddings.